The other day I had one of those moments where I found myself saying something pithy and wise ;) that I didn't plan. I was talking to a writer over the phone about a pitch he'd made by e-mail -- a sketchy and unformed, albeit interesting, pitch -- and after we'd agreed that he should think more about the aspects we discussed and get back to me, he apologized (unnecessarily, as I know him and have worked happily with him before) by saying, "Sorry this was so half baked." I said, "Hey, you can't get to baked without going through half baked." He seemed to appreciate that. On the afternoon of September 30, 1955 an elegantly trim and all-but-new ocean liner slid from its berth on the Hudson River in New York City and headed for England. With its other passengers in tourist class, I was among a group of some thirty American men bound northeast for Oxford University. Our ship was the S.S. United States which, on its maiden voyage three years earlier, had shaved ten hours off the prior record for transatlantic voyages. We'd be five days on the early-autumn sea and, with any luck, could dodge the great storms that had roiled the Atlantic in recent years. The reason for my personal interest is that eight years later, as a 21-month-old, I was a passenger on that same ship, sailing in the opposite direction, from Europe to America, as my family returned from two years abroad. Just something Reynolds Price and I have in common with Vivian Vance, Bill Clinton, the Duke and Duchess of Windsor, Suzanne Pleshette, JFK and Jackie, and Eydie Gormé. Our ship was the Italian Line's Vulcania, just recently renovated and decorated after the war. Our vacation started immediately, and we literally swam our way across the Atlantic in the second-class swimming pool. . . .
Last May when I learned that I had been selected by the scholarship committee, I thought I could not be happier or more grateful, but now that I have spent those seven unforgettable weeks in Italy, and know exactly all the things that I am thankful for, I find that there simply are no adequate words to express my deep appreciation to you all. Moreover, such a summer full of profitable learning, pleasures, and friendships cannot be repaid. Now because of falling in love with Italy there remains, along with memories, only an insistent need to see her again. She did see her again, when she returned to Rome for a year as a Fulbright scholar in the early 1950s. For her, no memories remain. The Vulcania was scrapped in 1974. "The worst case scenario is that she's torn apart on the beaches of India," says Susan Gibbs, president of the S.S. United States Conservancy, a nonprofit dedicated to saving the ship. Gibbs hopes potential buyers will want to adapt her as a hotel, restaurant, or museum. "She needs to endure as a vibrant symbol of postwar America, the triumphal spirit of that age." In November I went on vacation to Prague. This was my first time in continental Europe in 27 years and my first ever in the Czech Republic (or that country's previous incarnation). Have you noticed how many times I refer to my time in Europe in 1981-82? I think it's safe to say it was a seminal and memorable time in my life. Though I've traveled to some interesting and beautiful places since then, it's not too surprising that none of them have have triggered the level of discovery and growth that living on a foreign continent can afford a 20-year-old. En route to meet D. in Prague, I had five hours in the Frankfurt airport, which was fun, though I was shy about using my German. On top of simply being very rusty, it turns out I still suffer from a form of the same affliction I did all those years ago: not speaking until I'm sure that just the right vocabulary will come out perfectly grammatical and syntactically correct. Which, in the end, is the same as not speaking very much except to buy postcards and ask where the nearest mailbox is. In the Czech Republic (a country where I have roots on my mother's side), I eventually screwed up my courage to say dobrý den (hello) and děkuji (thank you) in shops and restaurants. Before the trip, my 89-year-old linguist father, whose memory fades more every day, had helped me with some pronunciations. We sat in the courtyard of his assisted-living facility with a not-very-clear phrase book from the Communist era. Russian was the main language Dad used in his career, and he knows at least bits of countless languages, so his lips formed the Czech words with an ease that didn't come as naturally to me. My mother, whose maternal grandparents were Czech and who studied and taught many languages herself (Latin primarily), virtually all of which she's forgotten, sat silently by, enjoying the breeze of a warm October day. 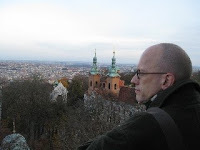 Here's a picture of me looking out over the breathtaking city of Prague. I might be thinking about my Czech ancestors I never knew, or about the fumbling American boy in Europe I once was, or about my parents and their disappearing words. Or I could just be taking it all in, for a day when I'll look back and wish I could do it all over again.